There are lots of options available in driveway materials, including asphalt, gravel, brick and pavers. In addition to variables like the cost, the look, and the durability of each, there’s another factor you may not have thought about, but which is important. That’s drainage. Your lawn and garden can absorb water when it rains. Your driveway can either absorb water or shed it—but either way you need to consider where that water is going, so it doesn’t end up in your garage or basement. 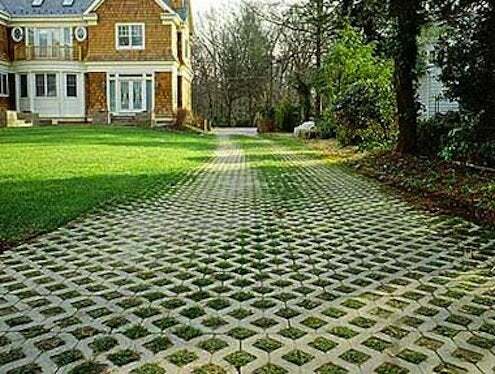 Some driveway materials, like brick and pavers, are permeable because the little spaces between them allow water back into the ground where it belongs. A driveway that’s covered in a nonporous material like concrete or asphalt needs to be pitched in a way that directs water away from your home, or it needs a drainage trench along the side to divert water. No matter what material you choose, if your driveway runs downhill toward your garage, you should install a trench in front of the garage door to stop water before it enters.